Tiny homes are a popular trend that allows people to live simply and affordably. But just because they are compact spaces doesn’t mean there isn’t room to get creative. To get you into the Halloween spirit, here are seven homes and resorts that don’t need any spooky decorations, because each tiny home itself represents the holiday perfectly with whimsy, imagination and larger-than-life personality. If you have dreams of going to outer space, you will love this tiny home inspired by the Apollo 11 mission to the moon. 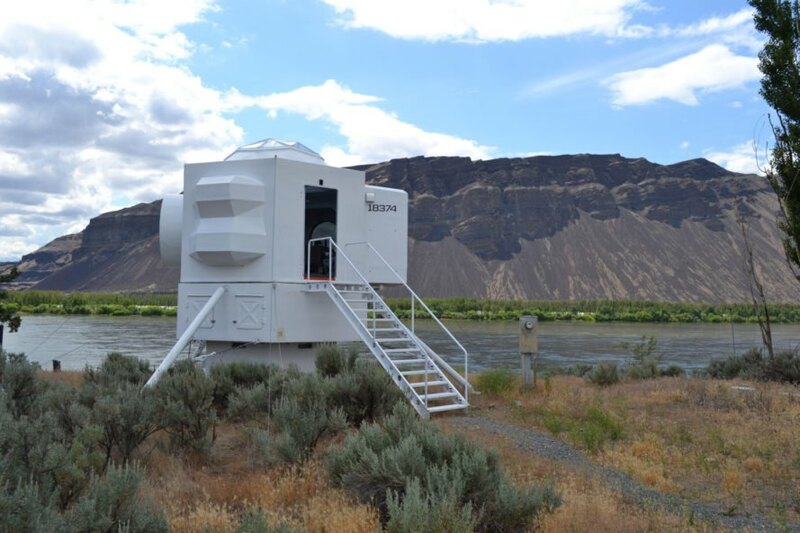 Located in Central Washington at the edge of the Columbia River, this tiny house — named the Lunar Lander — is elevated on steel pillars for minimal site impact and is only 250 square feet. Naval architect Kurt Hughes designed and built this home using boat-building techniques and materials like plywood, epoxy and fiberglass. The result is a unique and futuristic tiny home that is also environmentally friendly. 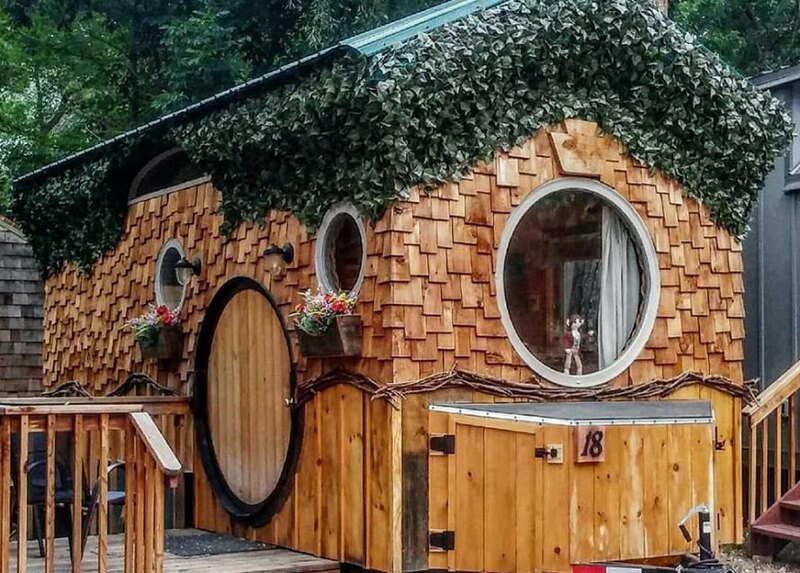 This 170-square-foot tiny house on wheels has a circular front door and an ivy-clad roof that will make you feel like you are living in the shire. 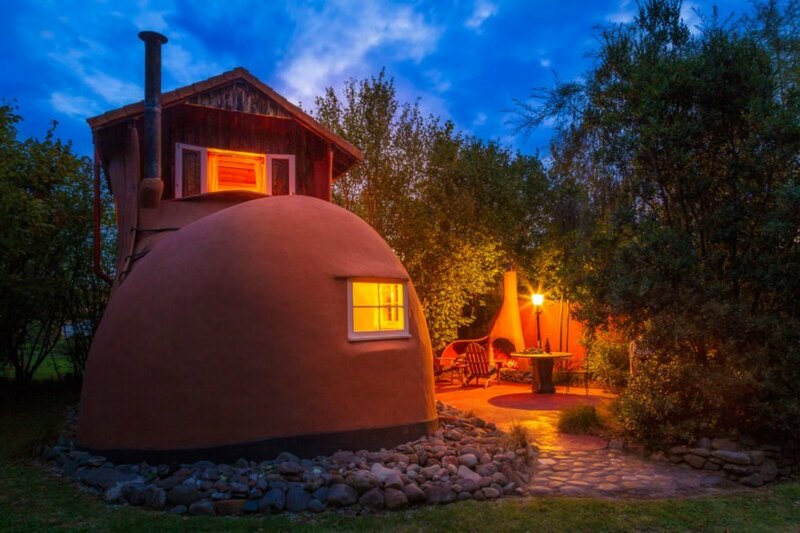 Located at the WeeCasa Resort in Lyons, Colorado outside of Rocky Mountain National Park, visitors can choose to stay at one of the 22 tiny homes at the resort, but the Hobbit House is the most popular. The structure features handcrafted wood in the interior, plus a relatively spacious kitchen and living area. If you love The Lord of the Rings and The Hobbit, this might be the perfect place for you. Who would have thought you could build a house in the shape of an owl? These original wood cabins are located in Bègles, France. 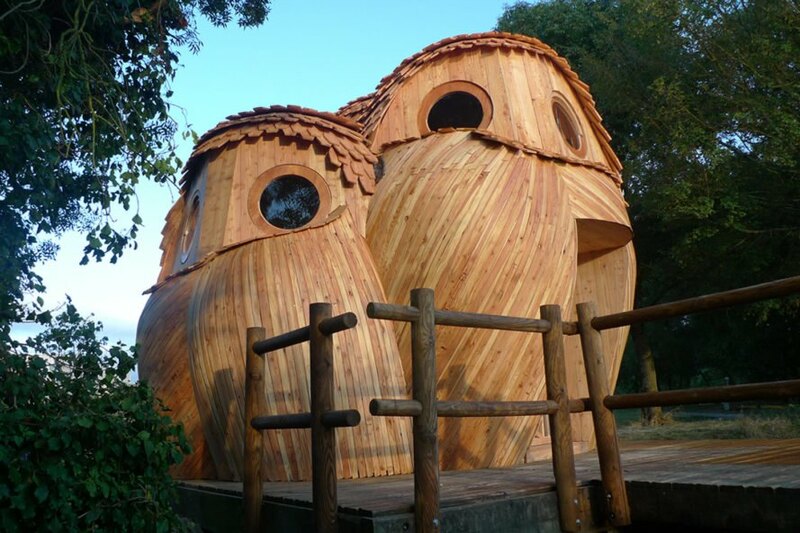 The tiny homes are designed to look like three owls sitting together. Full of whimsy and magic, each 160-square-foot home is free to tourists and campers visiting the Bordeaux region. The dwelling operates completely off the grid; there is no electricity or water access, but there are enough beds for nine people. The idea is to promote urban hiking by offering free nights in shelters. The project is an initiative of Bruit du Frigo in collaboration with Zébra3, financed by Bordeaux Métropole and with participation of the hosting municipalities. 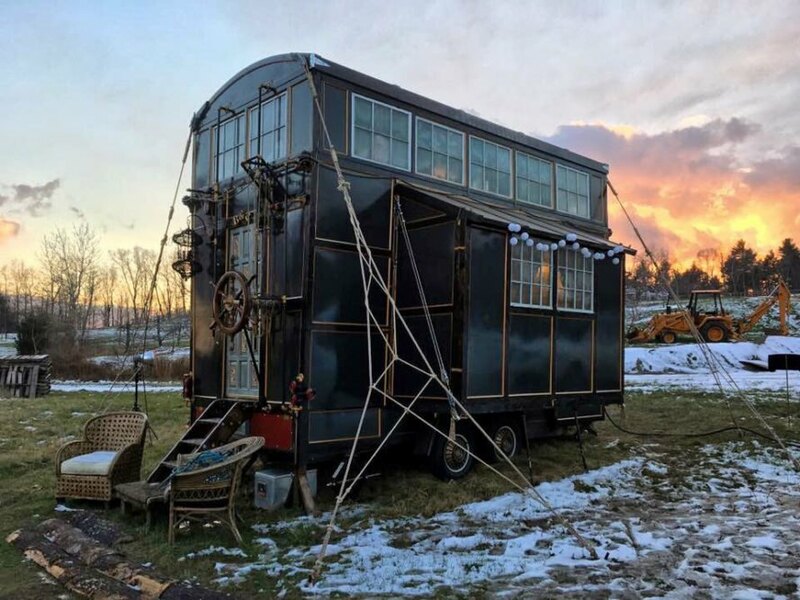 This steampunk tiny house has a wooden ship’s wheel and a pulley system, and the owners said that it “grew out of the movies.” Chloe Barcelou and Brandon Batchelder work in film, and they wanted to build a tiny home on wheels that they could take anywhere in the country — wherever the film jobs were. The all-black home looks like a mix between a pirate ship and 19th-century stagecoach, and Barcelou and Batchelder also added a steel blue door and ornately stenciled steps for easy access. The tiny house trend has become insanely popular in recent years, but Javier Senosiain of Arquitectura Organica was way ahead of the tiny home boom when he built the Nautilus House in 2006. Located near Mexico City, Senosiain said that he used “bio-architecture” to design the home, meaning the form is based on a living creature. Senosiain went all out with his shell idea and used stained glass in an unexpected and gorgeous manner while creating a living room that doubles as an indoor garden. There was an old woman who lived in a shoe … but now, you can live in this magical boot in New Zealand. Available to rent on Airbnb, The Boot is a tiny home with a huge personality. Despite its quirky exterior, this fairytale-inspired home is a romantic retreat complete with crackling fireplaces, chocolates, homemade goodies and a private courtyard designed for snuggling. It’s the perfect vacation spot for Halloween or Valentine’s Day! Travel back to the Wild, Wild West at the Yosemite Pines RV Resort. Offering the ultimate glamping retreat, these covered wagons can accommodate up to six people each. Nearby, guests will find a community fire pit and swimming pool; the resort also offers year-round outdoor activities. Nature walks, hayrides, outdoor movie nights and hiking take place in the fall, making this retreat ideal for autumnal enjoyment. Just in time for Halloween, here are several tiny homes that exude the season's spooky and spectacular vibes. The Lunar Lander is a tiny home inspired by Apollo 11. The Hobbit House allows guests to experience what life is like in the shire. These enchanting tiny homes offer free accommodations in the Bordeaux region of France. Designed by a couple in the film industry, this steampunk home feels just like an old pirate ship. Architect Javier Senosiain drew inspiration from nature when creating this beautiful tiny home shaped like a seashell. The Boot is a fairytale-inspired hotel in New Zealand that is ideal for a romantic getaway. 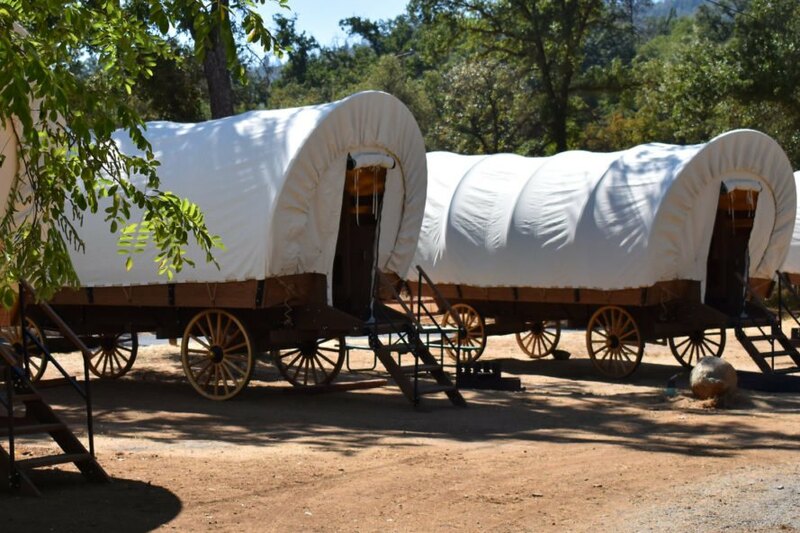 These covered wagons offer guests a glamping experience near Yosemite National Park. 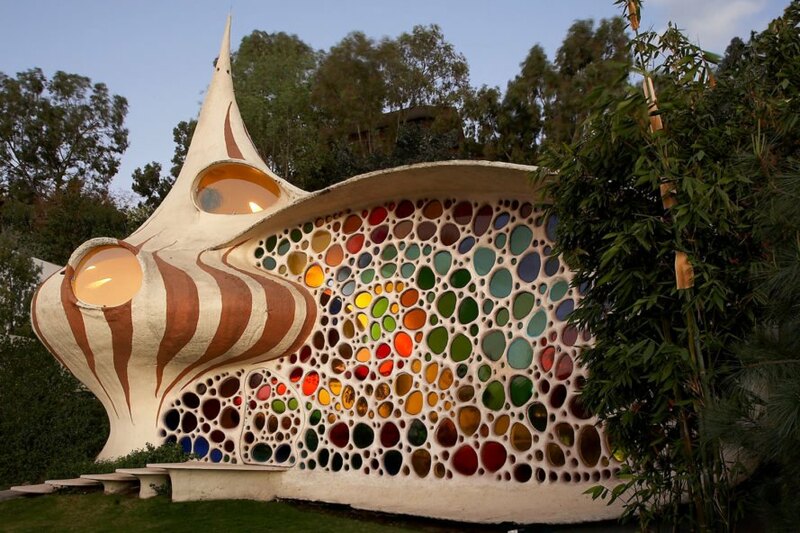 Which whimsical tiny house is your favorite?